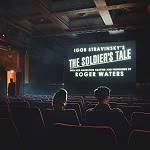 Roger Waters performs his adaptation of Stravinsky’s theatrical work "The Soldier’s Tale"
More information: Co-founder and former member of Pink Floyd, Roger Waters performs his adaptation of Stravinsky’s theatrical work "The Soldier’s Tale". Waters’ is an internationally acclaimed musician. He has sold over 250 million albums worldwide as part of the progressive rock group Pink Floyd and won multiple awards. He was inducted into the UK Hall Of Fame in 2005 and the US Rock and Roll Hall of Fame in 1996. His 'Wall Live' tour is the highest-grossing tour of all time by a solo artist. Roger now presents an album inspired by his personal connection to the tragedies of war. Water’s grandfather died in battle during World War I and his father went missing during World War II. Waters’ personal connection to Stravinsky’s The Soldier’s Tale is evident through his adaptation of the English translation.